How would you like to have a box of retro pick n mix sweets and treats delivered directly to your door? With Mr Big Tops you can have just that! We purchased some delicious goodies from the online store recently, it's the ideal way to find those well loved traditional sweets, and we were really pleased with the quality, variety and freshness of our order. So much so, we've teamed up with the company to giveaway 5 boxes so you can see just how good they are too! The box, which is recyclable, fits through your door perfectly so you don't need to worry about missed delivery cards and trips to the post office to collect your parcels. You can return home and have you sweets sat waiting for you to indulge! They have push and peel style lids similar to an advent calendar so even little ones can open them with ease and the sweets inside are sealed within plastic packaging for ultimate freshness. The boxes are great value at just £3.95 for 395g which includes FREE delivery. Just 12 of the 60 sweets available! I like the element of surprise, as the sweets are selected for you, but you are still able to pick which ones you aren't keen on from the 60 different sweets available to ensure you don't receive ones you dislike or may be allergic to. You will receive 6 varieties in each box. You can select a one off delivery to yourself or a friend or sign up for fortnightly, weekly or even a twice a week subscription. I ordered ours as an end of week treat to enjoy on family movie night! It saved me going out in the cold to the shop when I'm busy with other things. I was left feeling quite nostalgic tucking into fizzy bottles, foam frogs and my favourite; Strawbs. There is a referral scheme available, you can place orders to friends with personal messages sent to their mobile device and there are sometimes offers inside your lid to claim too - they really have thought of everything! 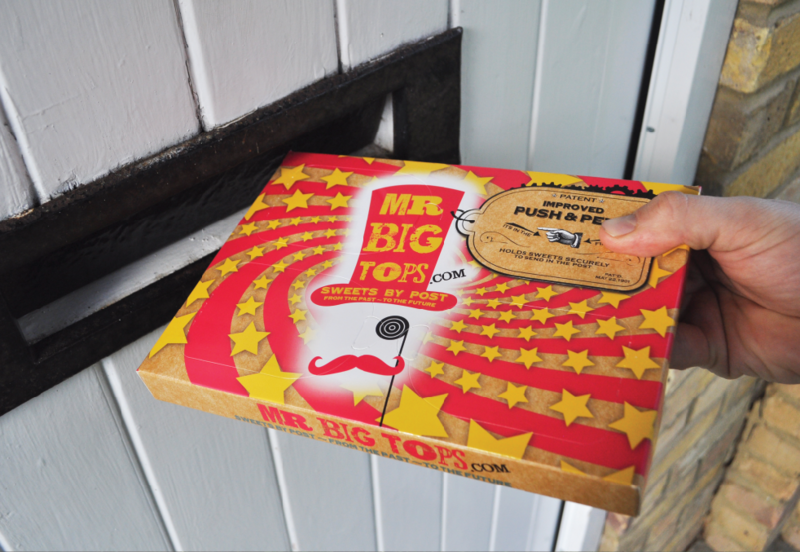 For you chance to win 1 of 5 boxes of sweets from Mr Big Tops you can enter via the Rafflecopter entry form below. The giveaway closes at midnight 2nd February 2014.
clotted cream fudge, flying saucers, mini strawberry pencils, love hearts, white choc mice and strawberry bon bons! Pooh, it would either be liqourice and aniseed or chocolate and toffee. Decisions. apple bon bons,bananas,coconut mushrooms,fizzy cola bottles,comforts,flying saucers too many to choose from just like a kid in a sweet shop lol. There are so many to choose from! I'd pick Black Jacks, Aniseed Balls, Coconut Mushrooms, foam strawbs, jelly buttons and watermelon slices. Yum! So much to choose from but here's my 6 choices, Cherry Cola Bottles, Black Jacks, Cherry Bon Bons, Heart Throbs, White Choc Mice & Coconut Mushrooms. Choc raisins, Cherry Cola Bottles, White Choc Mice, Jelly Babies, Sherbet Lemon and strawberry bonbons! Love Hearts, Pear Drops, Love Heart Squashies, Refreshers, Rhubarb and Custard, Jelly Babies. I'm following you on bloglovin'.I would love to try the following 6 retro sweets:cola bottles,strawberry Bon bons,milk bottles,giant strawberries,gummy bears and pear drops.Thank you for a great give away!! Wooohoo! Fantastic. Given me a great idea for OH Valentines Gift. I would pick... Strawberry Laces, Mushrooms, Milkshake Bottles, Jelly Babies, Foam Strawbs, Assorted Mallows. 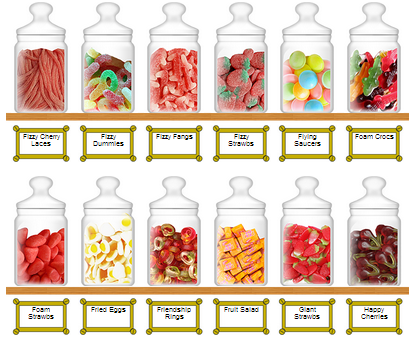 Spoilt for choice, but I'd go for foam crocs, fruit salad, jelly snakes, kola cubes, love hearts and pear drops! Choc peanutes, choc bananas, giant strawberries, milkshake bottles, spinning tops, and white choc mice. I want them!! I've followed on pinterest and G+, I ordered a box in the preorder stages and oh man, loved it! definitely ordering again around exam season! Following on Bloglovin', Facebook and Twitter. So many sweets, what to choose?. Fruit Salad, Clotted Cream Fudge,Jelly Babies, White Choc Mice, oh! and Black Jacks , Drumsticks and Jelly beans for hubby! all my favs! bananas, chocolate bananas, chocolate peanuts, chocolate raisins, flying saucers and coconut mushrooms!! aniseed balls, chocolate raisins, coconut mushrooms, foam strawbs, jazzies, kola cubes! I want more than six! Cola bottles, white mice, milk bottles, foam bananas, jazzies, fried eggs!!! What a great selection I would choose cola bottles, baby dolphins, friendship rings, wine gums, white choc mice and vanilla fudge. Milk Shake Bottles, White Chocolate Mice, Shrimps, Love hearts Squished, Clotted cream fudge, flying saucers. Apple bonbons; Cherry Cola bottles; Black Jacks; Foam Crocs; Jazzies; Kola Cubes. Ooh yum. My top 6 would be Baby Dolphins, Clotted Cream Fudge, Fried Eggs, Foam Strawbs and Mini Strawberry Pencils! mmmmm, strawberry bonbons, mini strawberry pencils, jazzies, jelly babies, fizzy dummies and bananas. The strawberry laces, jelly babies, dolly mix, strawberry bon bons, pear drops and fried eggs. Pamela says - Black Jacks; Cherry Bon Bons; Clotted Cream Fudge; Fruit Salad; Pear Drops and Liquorice Comfits. That was a hard choice but: Bananas, Dolly Mixtures, Refreshers, Jazzies, Sherbert Lemons & White chocolate mice! Fruit salad, black jacks, chocolate bananas, pear drops, jelly babies and white mice - yummy! I follow via pinterest,bloglovin and google +. mmm i'd love clotted cream fudge, dentures, flying saucers, mini strawberry pencils, watermelon slices & wine gums! I commented on blog :- Pine Cones Hedgehogs.